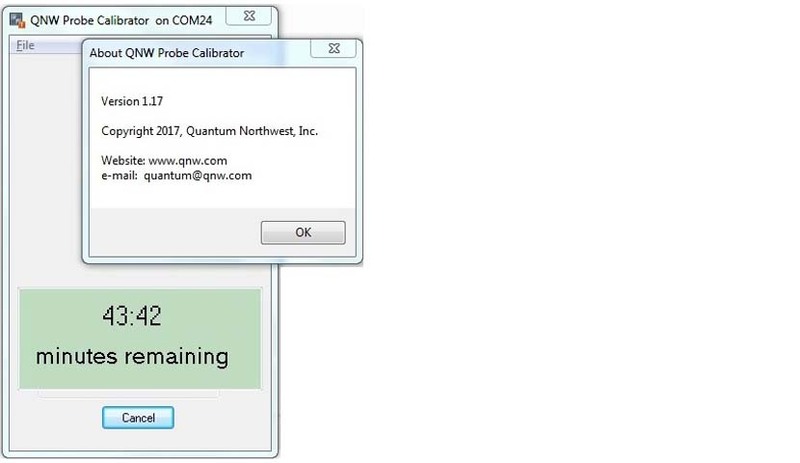 Probe Calibrator can be used to fine tune the calibration of a Series 400 thermistor probe (2252 Ohms resistance at 25 ⁰C) to agree with the calibration of the Quantum Northwest temperature controller/sample holder, thus taking advantage of the NIST-traceable calibration of the Quantum Northwest product. For this process, the probe must fit into the 1/8-inch (3.175 mm) diameter “probe hole” of the Quantum Northwest sample holder and be connected to the external thermistor probe input of the temperature controller. The resulting calibration is valid only with the specific probe used during the calibration process. The temperature controller includes the probe reading in its front panel display; the probe reading can also be monitored using T App. Quantum Northwest has thermistor probes designed for use with our products to accurately measure the temperature of a liquid sample in a cuvette with minimum internal dimensions of 1/8 inch or greater (see Probe/QNW1 and Probe/QNW2). These probes, when used with a Series 400 thermistor thermometer (including the external probe input of Quantum Northwest temperature controllers) are accurate to better than ± 1 °C. The Probe Calibrator application is included with the purchase of Quantum Northwest thermistor probes and, after being used to fine tune the TC 1 calibration, the readings will be accurate to better than ± 0.2 ⁰C.